ENDA KENNY SPENT around three hours on the streets of Dublin last night talking to homeless men and women, it has emerged. Kenny was out with Dublin Lord Mayor Christy Burke and the director of Inner City Helping Homeless (ICHH) Anthony Flynn to see first-hand the homelessness situation on Dublin’s streets. The event was not publicised in advance and news of it only emerged when the ICCH issued a press release in the early hours of this morning. ICHH said that Kenny joined them as they conducted their outreach programme on the city centre streets at around 11pm last night. The Taoiseach was out until 2am as ICHH fed some 136 people around the Temple Bar and Grafton Street areas. He spoke to nearly two dozen people about their experiences. “‘It was great to see the Taoiseach at the root of the problem, he got to see first-hand the conditions that people are living in on the streets,” Flynn said in a statement this morning. A spokesperson for the Taoiseach confirmed he was out on the capital’s streets last night, saying Kenny felt it was important “to engage and hear their stories”. “He was out until 2am. He was very moved by it, it was a cold night and he met with 23 people, chatted with them and spoke to them about their individual situations. He felt it was important to see first-hand the challenge of sleeping rough,” the spokesperson said. 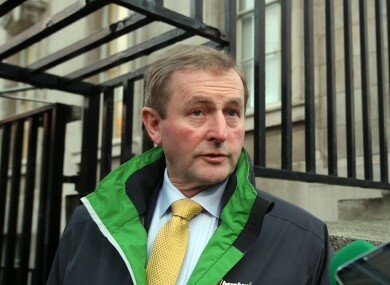 Read: How safe is Enda Kenny as Fine Gael leader? Email “Enda Kenny was on the streets talking to homeless people last night”. Feedback on “Enda Kenny was on the streets talking to homeless people last night”.